Strategic planning is a management process for evaluating your current business, determining your strategic direction, and laying out a roadmap of strategic initiatives. A strategic plan explains why an organization exists, what it intends to accomplish, and the tactics it will take to achieve its goals and objectives. Our approach is collaborative, forming a team with key leaders within the client’s organization, and developing the business strategy in five main phases. Many business strategy projects are long on planning but short on action. 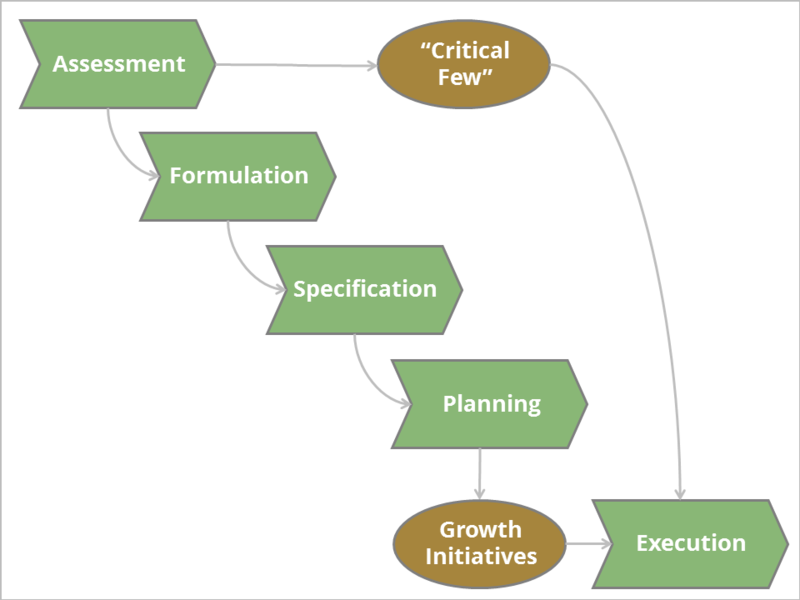 Our management consulting methodology remedies this in the assessment phase by identifying the three to five most critical issues (the “critical few”) and expediting them directly into execution. This allows quick development of executable action plans in parallel with the rest of the business planning process to develop the growth initiatives. This approach delivers faster results and surfaces any potential issues that the organization has in execution.